"Lab Tick to the rescue!" "This is a great utility!" "Everyone who uses a Mac Book Pro is in your debt, WAY in it." "Better than fuzzy dice for my PowerBook." "Thank you so much for Lab Tick!" "Lab Tick is a very good idea and a useful tool." Lab Tick - Introducing Control. Have you ever been annoyed by your PowerBook's (or MacBook Pro's) backlit keyboard? You can not control it, you simply have to deal with the behaviour dictated by the ambient light sensor, which sometimes does not work really well. The idea of a backlit keyboard is awesome, but the implementation in Mac OS X has its flaws. Lab Tick aims to fix them. Latest version (0.9.4) - only 1.2 MB, and it's free! Be sure to read the included read me file. System requirements: PowerBook or MacBook (regular/Pro/Air) with backlit keyboard, Mac OS X 10.5 or later. Tiger users: please download Lab Tick 0.9.2, which is the last version to work on Tiger. Check out my new iPad app, Folio Case! I accept donations for Lab Tick. Please ensure further Lab Tick development by donating. Introduced full 64-bit-support for Mac OS X 10.6 Snow Leopard. Introduced support for fast user switching. Reduced memory usage by eliminating several leaks. A number of minor bug fixes and improvements. Dropped support for Mac OS X 10.4 Tiger. Fixed a power management issue which caused the backlight to not come back on after being idle. Added an option to permanently suppress the donation window for contributors. Fixed the welcome window so it will be displayed above other windows. Adjusted the updates to the illumination controller to reduce flicker. 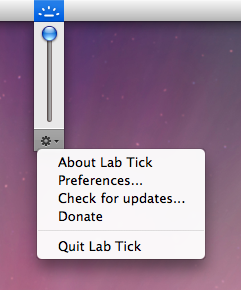 Added localization for the "About Lab Tick" window. Fixed some small localization issues. Improved handling of sleep/wake up events. Added a donation menu item. Added a donation window (don't worry, it won't bother you much). Updated menu bar icon for Mac OS X 10.5 (Leopard) - courtesy of Zak MacDonald. Updated application icon (512x512) for Mac OS X 10.5 (Leopard) - courtesy of Zak MacDonald. Fixed bug: adding the application to the login items did not work. Changed the application to run as a menubar application without a Dock icon. Added automated update checks with Sparkle. Redesigned "About" window with updated credits. Added credits to the "About" window. Modified lock method to run within the same run loop as the main application without requiring an extra thread, thus making the lock mode many times as efficient as before in terms of CPU cycles consumed (about 0.20-0.30% on a PowerBook G4 1.67 GHz). Added an option to automatically launch Lab Tick at login. Included an icon file (thanks to Stefan Hartmann). Fixed a small crashing bug. Made the application terminate when the window is closed.